To get started, you’ll need to talk with an NPC in the Temple of the White Tiger in Kun-Lai Summit or class trainer, who’ll grant you entrance to the instance. Upon entering the Proving Grounds, your gear will be scaled down much like it is in Challenge Modes. Depending on the role you choose, you may not have to go it alone. One tank registers his disappointment in the PG scenarios, basically calling them too easy. He wants something a little more like the real dungeon/raid encounters. That sounds like a good idea, perhaps we’ll see that later if the PGs prove successful. What tanks have been given so far on the public test realms (PTR) is an arena-like setting where wave upon wave of various enemy types come charging at an NPC the tank is instructed to protect. There are four difficulty levels: Bronze, Silver, Gold and Endless. I logged onto the PTR to try out the Proving Grounds on my Death Knight tank and could see right away how some would find the current design useful. However, ignoring the bugs with both the instanced event and my class (PTR is PTR, after all) I must admit to being disappointed. What I would like to see is a small dungeon layout with packs of trash requiring tactical pulls, a ready-check confirming the tank is wearing tank gear and a brief explanation of defensive cooldowns and why they’re important. Will Proving Grounds be the new litmus test for players? Personally, I think this is very likely. At least among people looking for groups in chat. Remember when they’d be looking for people with minimum gear scores? Minimum achievements? This won’t be much different. Maybe it’s even a good idea. If a player can’t handle the easier PG scenarios, they probably won’t be much help in the dungeon/raid. Groups of friends or friendly guildies won’t care, and will probably even help out, but other groups will. A few days ago there was a thread on the official forums where a player expressed concerns that the new Proving Grounds feature would be used by PUG leaders to filter invites for groups, raids, or any other group content. Because Proving Grounds essentially grades any participants, the fear is that trade chat will be flooded by folks looking only to invite players with, for example, a gold medal/completion. Bronze and silver need not apply. It’s a pattern that has repeated itself many times whenever a new way of evaluating players was added to the game. In the past we’ve seen PUG leaders demand armory links, gearscore/average iLevels, and even achievements proving completion of the raids that they were organizing for (which often created Catch-22 situations for many players). The challenges in them though are fairly easy if you know your class, at least for the bronze level, but can get pretty tricky to complete at the gold level if you don’t. For those players that just jump on and play, and don’t really understand stats, gear, reforging, and other key parts of the game, these will be way over their head. Overall they do a fairly decent job of testing your ability to play your role, even if it is very simple. The Grumpy Elf has a few things (quite a few things) to say about the whole Proving Grounds thing and the likelyhood that people will use it as a litmus test. Reading an article over at wow insider about the proving grounds feature coming up made me think about the situation of it being used as a yardstick to measure a players worth. I have thought on this before I read the article, thought about it a lot since it was first released. I even have considered making some level of it, maybe even as low as bronze, a prerequisite to join the 25 man raid team when it comes out. Does that make me a bad person? Let me give you a little background on me however just in case you do not know. I hate people that list in trade some silly requirement to join their pug. Absolutely hate it. I even hate people that would post “meet me in the trade district for inspection”. You either want me or you don’t. If you are too lazy to type my name into battle.net and look me up yourself then I am too lazy to come find you for inspection. You are looking for me to join you, not the other way around. so you do the leg work. End of story. It’s a pretty nice overview of what’s happening. Since it’s all still on test assume there will be changes. The narrator remarks that she expects it to be more difficult on live. Perhaps that’ll make that tank (above) happy? Frost mage DPSing. This is very early on the 5.4 patch test realm (PTR.) Pretty much just DPSing and leaping out of the fire. Patch 5.4 already? When they said patches would be coming more frequently they were not kidding – we’ve only been in patch 5.3 for a month or so and patch 5.4 is already on the PTR . And it is packed with new features, some of which we’ve been waiting for all expansion, like the long discussed proving grounds . WoW Insider posted a couple of days ago about Blizzard Community Manager Nethaera’s blog on the new Proving Grounds feature coming in the Patch 5.4 PTR. Just as you would expect following that post, the proving grounds have launched on the PTR. Wowhead’s Perculia has put together a great summary that expands on Neth’s blog and provides a good deal more detail in the encounters, mechanics and so on that players can expect to meet in the Proving Grounds. Having spent some time in them today, coupled with Perculia’s research, I feel relatively well placed to provide a short run-down on what to expect in the different sections and difficulties. First up, where are they? 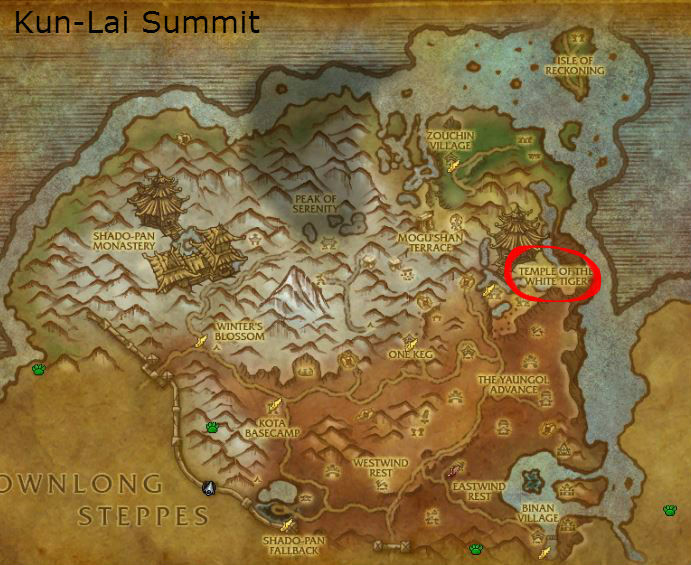 The proving grounds are located in the same spot as the Arena of Annihilation, the White Tiger Temple in Kun-Lai Summit. If you get there and can’t find the NPC, and instead see a white tiger, you are phased and need to complete the opening of the Vale quests. Fortunately, it’s only three quests. Once you’re there, speak to Rotun and get started.